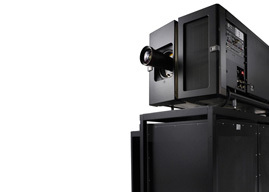 CinemaNext is the largest cinema exhibition services company in Europe, providing smart, comprehensive solutions across the board, from projection equipment, audio systems, central systems, cinema outfitting, content management, 3D projection systems & glasses, TMS, digital signage, screens and seating to consulting services. Clients enjoy the highest level of reliability and lowest cost of ownership through our various services: consulting, design & project management, equipment sales and financing, installation, maintenance, support (NOC), online monitoring, content management, spare and consumables, service agreements and supply chain & logistics. 13,000 screens have been installed by our technicians to date. 9,500 screens in Europe currently avail of service contracts with our company and 6,400 screens have been installed under Virtual Print Fee "VPF" contracts. Our main office is located in Liège-Blegny (Belgium). Regional offices can be found in 26 countries across Europe, the United States, Africa and the Middle East and Central Asia.